The Office Insider program gives you access to new features before they go mainstream. Microsoft is all about showing its work these days. You probably know Microsoft shares preview builds of Windows 10 leading up to major releases, such as the upcoming Creators Update. But did you know Microsoft offers an Insider program for Microsoft Office as well? If your heart starts racing at the thought of trying out new Excel power features, enhanced editing techniques in Word, or special rollouts like MacBook Pro Touch Bar support, then the Office Insider program is for you. Microsoft offers two levels for Insiders. There’s the Fast level for those who want the earliest possible access to new features. The downside of this level is that it’s more prone to bugs and other issues that could make using Office a frustrating experience. Then there’s the Slow level, which offers substantially less risk. Both options are available for Windows PCs and Macs, while other platforms may offer just one of those options. 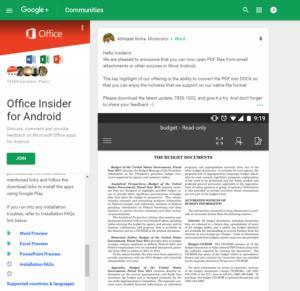 Here’s a look at how to join the Office Insider program whether you’re on a PC, Mac, Windows 10 Mobile handset, an Android phone, or an iOS device. The Office Insider program on Windows 10. Joining the Office Insider program for Windows requires an Office 365 subscription on either the Home, Personal, or University plan. Open a file in any Office 2016 program on your PC. Then go to File > Account. Then click the Office Insider tile, and from the drop down menu select Join Office Insider. In the box that appears, click the checkbox labeled Sign me up for early access to new releases of Office. Then select your desired Insider level—Fast or Slow—and click OK. Windows 10 will then put up a User Account Control (UAC) window. Click Yes, and when you return to your program you should see confirmation that you've joined the Office Insider program. There's a second process for joining the Office Insider program if that one doesn’t work for you. Go to the Additional Install Options page of your Office account, signing in if necessary. Choose your download in the Fast or Slow version. You’ll also have to decide on 32- or 64-bit builds depending on which version of Windows you’re using. Mac users don’t need to have an Office 365 subscription to join. All they have to do is open an Office application on their Mac. Then click on Help > Check for Updates. When the Microsoft AutoUpdate window opens, check the box labeled Join the Office Insider program. Choose the Fast or Slow ring, and you’re done. The Office Insider Community for Android. On a Windows 10 phone, you first need to join the Insider Program for Windows 10 Mobile, and choose the ring you want. Once that’s done you'll be automatically opted in to the corresponding version of Office, because these programs are built into the system. Joining the Office Insider program on Android is like joining the beta community for any other large app. First, join the Office Insider for Android Community, then wait a few hours for Google to confirm that you’ve joined. Next, follow the links provided in the lefthand column of the Community page to get the pre-release apps. On iOS, download the TestFlight app, then apply to join the Office Insider program for iPhone and iPad. Office Insider for iOS is available only at the Fast level. You'll be notified once you’re approved. Microsoft says its iOS preview program has a limited capacity, so it may take some time before you get to join. Microsoft may also drop you from the preview program if you're not actively testing the apps on iOS.